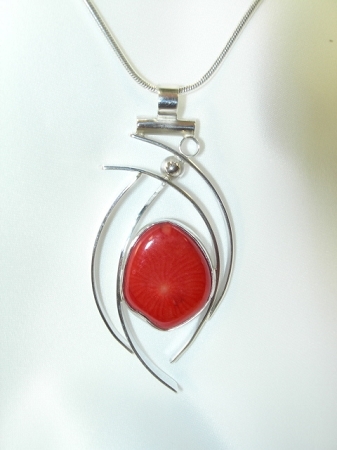 Classic Curves Jewelry - This is a beautiful handcrafted high polished sterling silver pendant featuring a freeform red Coral. This abstract One-of-a-Kind statement necklace comes with an 18" sterling silver snake chain. This handmade Sterling Silver pendant is from our "Wisps of Silver" collection. The airy style complements the organic freeform round coral which is fully bezeled in silver. The pendant is shown with an 18'' Sterling Silver snake chain. Designed, signed, and hand made by Aaron Rubinstein and Modern Art Jewelry .